The skeletal system is the framework of the body. The skeletal system consists of the bones, cartilage and the joints. There are 206 bones in the human skeleton. As with the muscular system, the skeletal system contributes to the mobility of the body. For more information about the muscular system, read the article 7 Facts About the Muscular System that Every Nursing Student Should Know. The skeletal system is normally associated with the muscular system because they work together to provide movement. This is accomplished because the muscles of the muscular system attach at points on the skeletal system. It is the coordinated contraction of the muscles and the bending and movement of the joints that produces movement of the different parts of the skeletal framework. 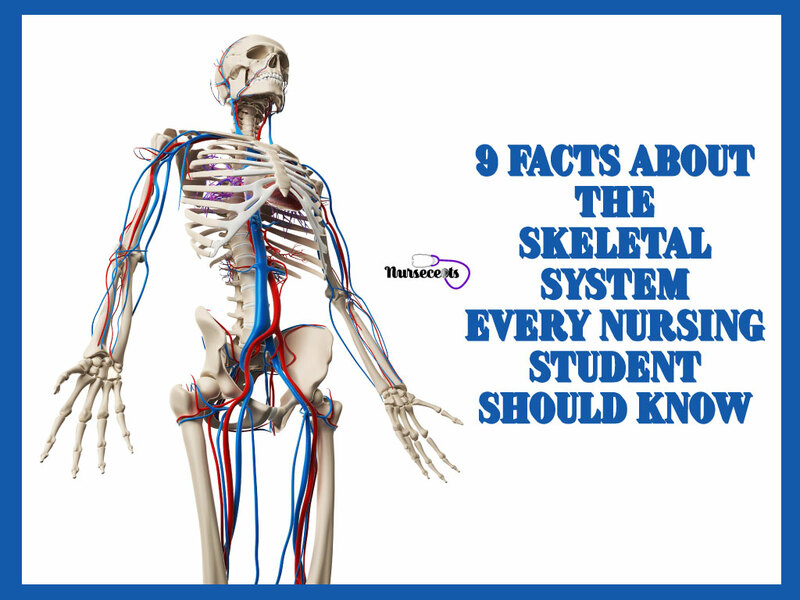 In this article we will cover 9 Facts About the Skeletal System Every Nursing Student Should Know. 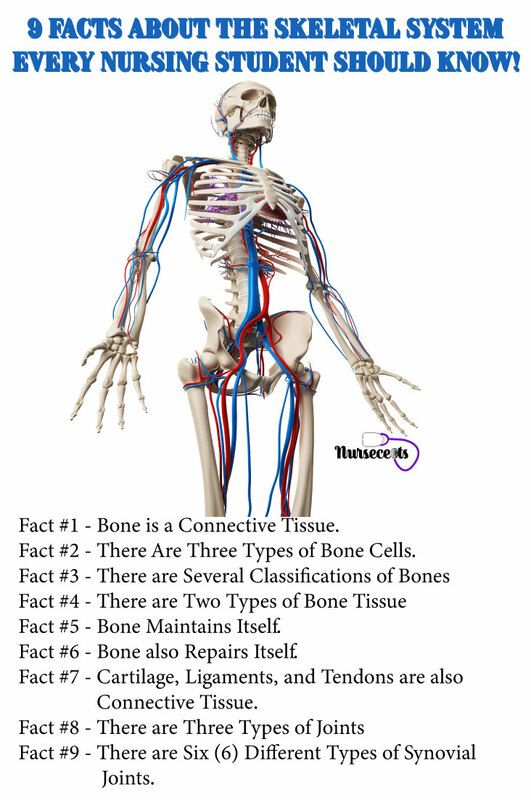 Fact #1 – Bone is a Connective Tissue. The bones are a living tissue. It is a connective tissue consisting of cells, fibers, and mineral deposits. Bones are in a constant state of maintenance and repair. The bones of the body provide support for the tissue and allow movement with the contraction of the muscles. The joints of the body are where two or more bones meet. The movement of these joints depends upon the type of joint. The bones of the body also protect vital organs. For example, the bones of the skull protect the brain and the bones to the thorax protect the heart and lungs. Blood formation is an additional function of the bones. The marrow of certain bones is where blood cells are formed. Also, the bone is responsible for storing essential minerals such as calcium, phosphate, and magnesium. 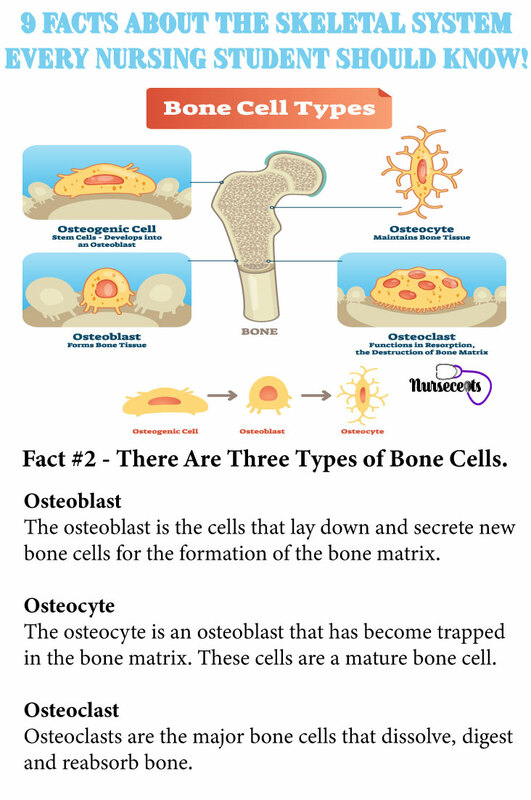 Fact #2 – There Are Three Types of Bone Cells. 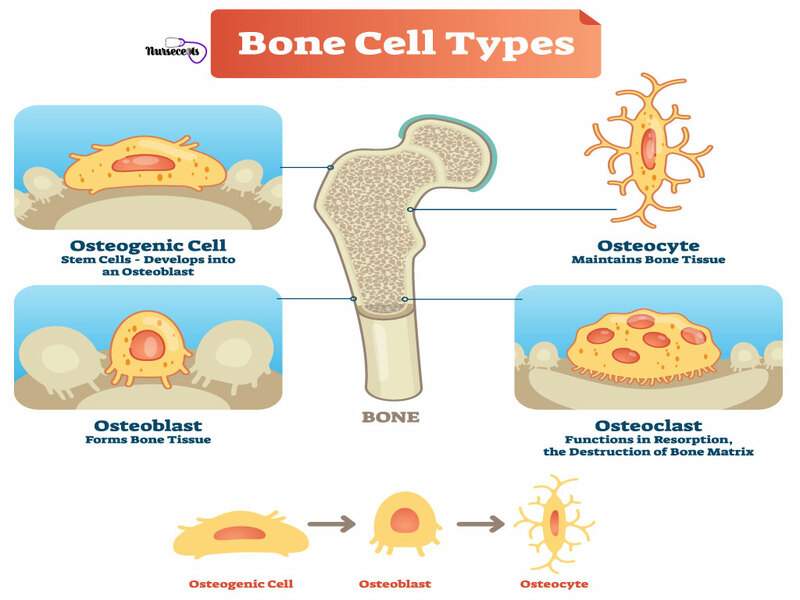 There are three types of bone cells: osteoblast, osteocytes, and osteoclast. The osteoblast is the cells that lay down and secrete new bone cells for the formation of the bone matrix. 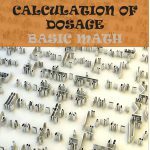 The majority of the bone matrix is the collagen fibers and ground substances that provide a framework for the mineral salts to deposit. These minerals include mostly calcium and phosphate. The osteoblast is responsive to the parathyroid hormone. The osteoblasts are usually active on the outer surface of the bone working on the bone matrix. Once an osteoblast has completed it functions it becomes an osteocyte. The osteocyte is an osteoblast that has become trapped in the bone matrix. These cells are a mature bone cell. They continue to synthesize new bone matrix molecules. The osteocytes are responsible for the maintenance of the bone. Osteoclasts are the major bone cells that dissolve, digest and reabsorb bone. The osteoclast attached to areas on the bone that need to be reabsorbed. These cells secrete hydrochloric acid and other acids that allows for the digestion of the bone. Once the osteoclast has completed its task it degenerates and becomes inactive. The periosteum is a thick fibrous connective tissue that covers the bone. This layer of connective tissue contains blood vessels, lymph vessels, and nerves. The blood vessels transport nutrients into the bones and facilitate its growth. The periosteum is where ligaments and tendons connect to the bone. The endosteum is a thin membrane that covers the medullary cavity. The medullary cavity is the hollow portion of the diaphysis (bone shaft). The bone marrow is stored in the medullary cavity. Bone marrow is a vascular tissue. There are two types of bone marrow: red and yellow. Red bone marrow makes blood cells (red, white and platelets). It is located mainly in the sternum, ilium, vertebrae and the ribs. Yellow bone marrow is mostly fat and can convert to the red bone marrow in times of emergencies. There are 206 bones in the human body. These bones are divided between the axial skeleton and the appendicular skeleton. The axial skeleton is the bones of the skull, the vertebral column and the rib cage (thorax). The axial skeleton consists of 80 bones. These bones provide protection for the brain and internal organs. The appendicular skeleton includes the bones of the upper extremities, lower extremities, the pectoral girdle, and the pelvic girdle. 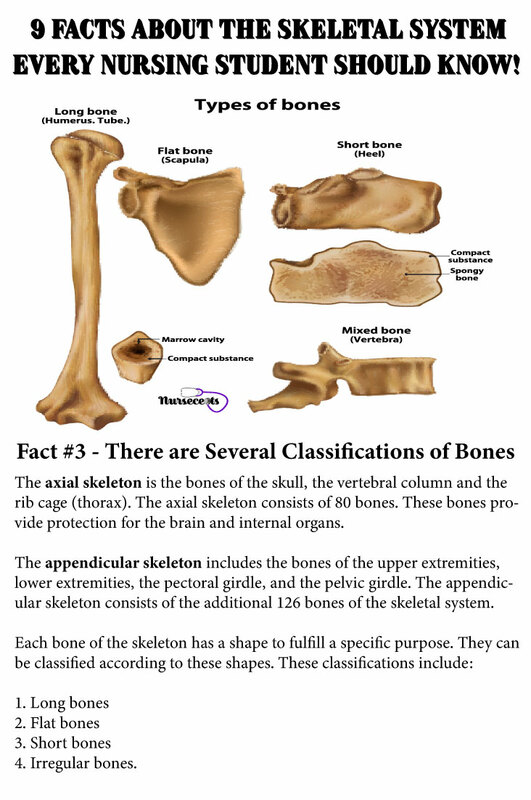 The appendicular skeleton consists of the additional 126 bones of the skeletal system. Each bone of the skeleton has a shape to fulfill a specific purpose. They can be classified according to these shapes. 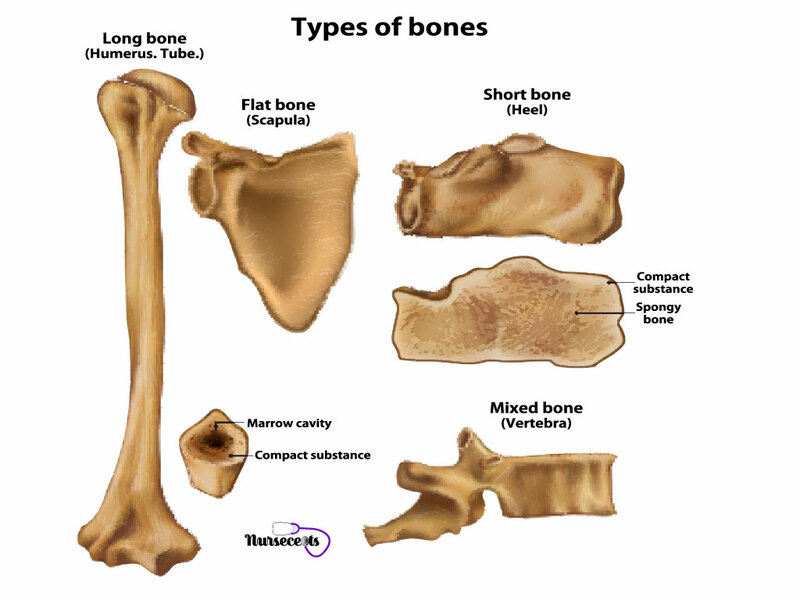 These classifications include long bones, flat bones, short bones, and irregular bones. Long bones are usually found in the arms and legs. These bones are longer than they are wide. Examples of long bones include the femur and the humerus. Each long bone consists of a shaft and a rounded end. The shaft of the long bone is the diaphysis and the end of the long bone is the epiphyses. Both ends (epiphyses) of the long bone are bigger than the middle (diaphysis) of the bone. In childhood, there is a cartilage layer between the epiphyses and diaphysis known and the epiphyseal plate. This epiphyseal plate allows for longitudinal growth. The plate calcifies in adulthood. Flat bones can be flat or curved. These bones are usually thin. Examples of flat bones are the bones of the skull, ribs, and sternum. Short bones are usually the same size and width. These bones consist of a spongy bone covered by a compact bone. Examples of short bones are the bones of the wrist and ankles. Irregular bones are bones of different shapes that fit together. Examples of these bones include the bones of the vertebrae, mandible and other bones of the face. The types of bone tissue include: compact and spongy. Each type of bone essentially contains the same elements. The difference is the organization of the elements. Compact bone is the outer covering of the bone. This bone is also known as cortical bone. It is a dense, hard and extremely strong tissue. Compact bone is thicker in places that receive the greatest stress. This bone tissue forms the shaft of long bones and the outer layer of other bone. The functional unit of the compact bone layer is the osteon or Haversian systems. The Haversian system is a round shaped unit. Capillaries run through the middle of this Haversian system. The Lamellae, a mineralized bone matrix, encircles the capillaries. Also, within the lamellae are lacunae which house the osteocytes. These osteocytes form concentric circles (circles that surround each other and have a common center) around the capillaries. The inner portion of the bone consists of spongy bone. The spongy bone tissue is also known as cancellous bone. The spongy bone tissue makes up the ends of the long bone, the skull, vertebrae, ribs, and pelvis. Spongy bone is not as dense as compact bone and is much lighter. Spongy bone does not have a Haversian system. The lamellae are not arranged in concentric circles but are arranged into a network of bands. The network of bands is called the trabeculae. The trabeculae are a crisscrossing network of tissue with irregular holes that give this bone tissue its spongy appearance. The lacunae which house the osteocytes are located throughout the trabeculae. Red bone marrow fills the trabeculae. Fact #5 – Bone Maintains Itself. Ossification is the formation of the bone matrix. This is when calcium and phosphate are bound to collagen fibers. Bones grow longitudinally to make us taller and horizontally to support the weight of the body. Bone ceases to grow in late adolescence; however, bone has the ability to reshape itself. 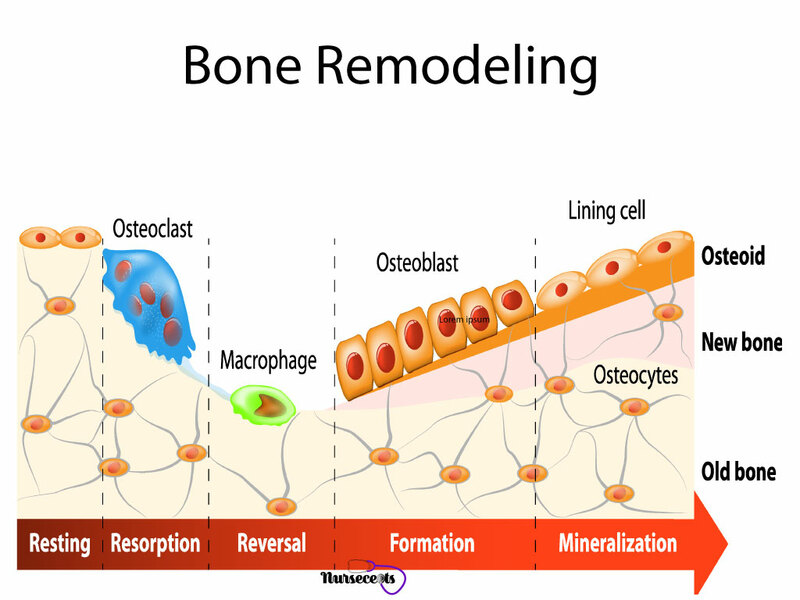 This is the process of bone remodeling. Bone remodeling continues throughout a lifetime. This process uses osteoclast to remove old bone and osteoblast to deposit new bone. 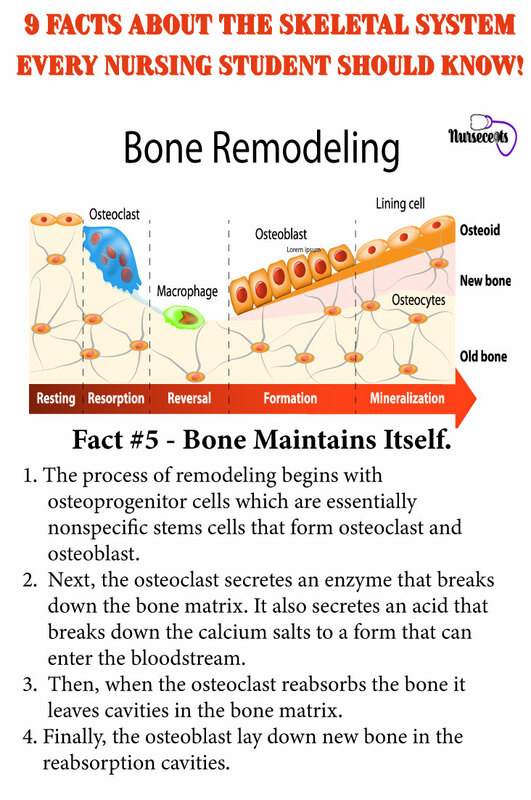 The process of remodeling begins with osteoprogenitor cells which are essentially nonspecific stems cells that form osteoclast and osteoblast. Next, the osteoclast secretes an enzyme that breaks down the bone matrix. It also secretes an acid that breaks down the calcium salts to a form that can enter the bloodstream. Then, when the osteoclast reabsorbs the bone it leaves cavities in the bone matrix. Finally, the osteoblast lay down new bone in the reabsorption cavities. Hormones, growth factors and vitamin D regulate the remodeling process. The process of bone remodeling takes about three to six months. It does not happen equally over the entire body at the same time. And, depending on age and condition of a bone, the process of reabsorption and formation will be different. For example during childhood when bone is growing, the bone formation will outweigh bone absorption. Also, bone remodeling happens at different rates to different bones. Bones that bear the greatest stress, such as your load-bearing bone, go through constant remodeling most often. Additionally, bone remodeling helps the regulation of calcium in the blood. Bone contains about 99% of the body’s calcium. Calcium is an important electrolyte for the functioning of the body. When serum calcium levels become low, the parathyroid hormone stimulates the osteoclast (cleanup and disposal cell) to release the calcium into the bloodstream. Consequently, when calcium levels are too high, calcitonin inhibits the activity of the osteoclast and less calcium releases into the bloodstream. 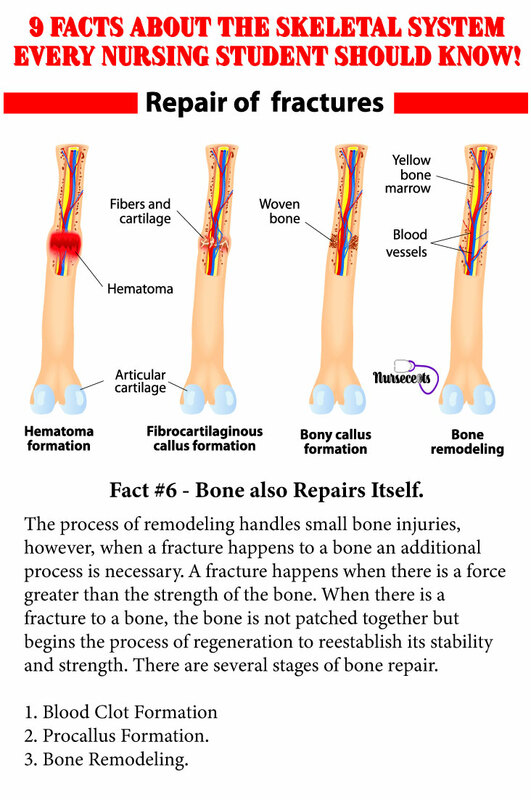 Fact #6 – Bone also Repairs Itself. The process of remodeling handles small bone injuries, however, when a fracture happens to a bone an additional process is necessary. A fracture happens when there is a force greater than the strength of the bone. When there is a fracture to a bone, the bone is not patched together but begins the process of regeneration to reestablish its stability and strength. 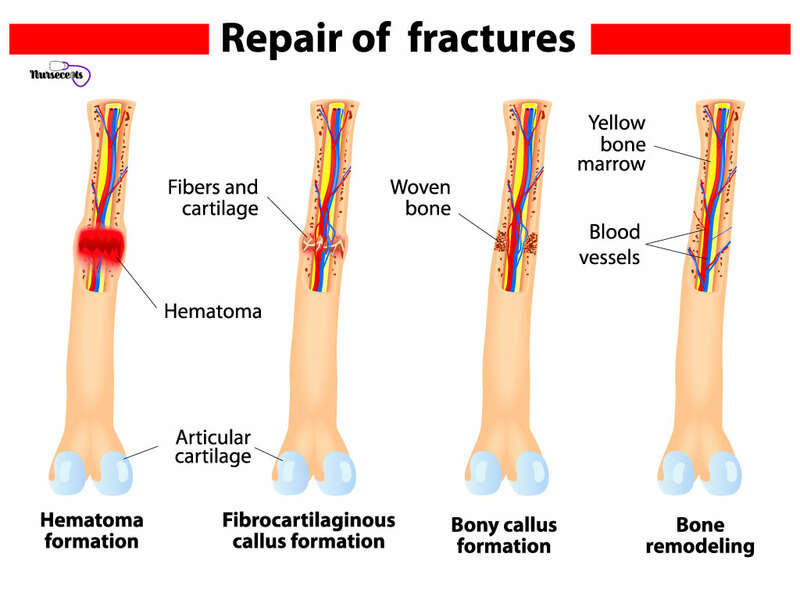 There are several stages of bone repair. Initially, when a bone sustains a fracture, the blood vessels in that area rupture. Bleeding into the tissue and vasoconstriction occurs. A hematoma forms causing swelling and pain. Cytokines initiate fracture healing by replicating fibroblast (undifferentiated cells that form osteoblast). This causes angiogenesis (formation of new blood vessels). Next, there is procallus formation. Procallus is granulation tissue that is a precursor to the callus. A callus is bony deposits that form around the broken end of a fractured bone during healing. The undifferentiated cells replicated by the cytokines move in from surrounding tissue. Some of these cells form fibroblasts. The fibroblast creates a network of collagen fibers. Other of these undifferentiated cells forms chondroblasts that secrete a cartilage matrix. The result of this stage is a fibrocartilage callus. Finally, remodeling of the bone begins. Osteoblast and osteoclast move into the injured area and begin to rapidly multiply. Osteoclast removes bone that is necrotic. Osteoblast secretes osteoid, which eventually replaces the fibrocartilage callus with a bony callus. The bony callus is denser than the fibrocartilage callus. The bony callus consists of the formation of a callus outside the fracture and a callus inside between the fractured area. The new bone will eventually be remodeled into compact and spongy bone. The bone will resemble itself prior to the fracture, but, it will contain some thicken areas following remodeling. Fact #7 – Cartilage, Ligaments, and Tendons are also Connective Tissue. Cartilage is a very dense, rigid connective tissue. It can withstand a lot of pressure and tension. Cartilage provides the articular surface for joint movement between bones. The cartilage in the epiphyseal plates assists in the growth of long bones. When cartilage is damaged, it does not heal very fast. Cartilage is not a vascular tissue and receives its nourishment from the synovial fluid. Because it does not have a blood supply the cell are slow to metabolize. There are three types of cartilage tissue: hyaline, elastic, and fibrous. Hyaline cartilage consists mostly of collagen fibers. Hyaline cartilage is in the epiphyseal plates, the trachea, nose, bronchi and the ends of bones. It acts as a shock absorber to prevent the bones from rubbing against each other. Elastic cartilage consists of both collagen and elastic fibers. This makes elastic cartilage more flexible than hyaline cartilage. Elastic cartilage is in areas such as the ear, the larynx, and the epiglottis. Fibrous cartilage consists mostly of collagen fibers but is tougher than hyaline cartilage. Fibrous cartilage acts as a shock absorber and is found between the vertebral disk, the knees, and the shoulder. Ligaments and tendons are also a connective tissue. They hold joints together and still allow for them to be movable. Ligaments are strong, whitish bands of tissue that connect bone to bone. Therefore, they can withstand a lot of pressure and stress. Tendons are another type of connective tissue that is more cord-like. Tendons connect bone to muscle. Ligaments connect bone to bone. Tendons connect bone to muscle. A joint is formed where two or more bones meet together. Joints provide mobility and stability of the human body. However, not all joints are movable. Some joints move freely, some joints move a small amount while other joints are immovable and provide structure and support. There are three different groups of joints. The three types of joints are fibrous joints (synarthrosis), cartilaginous joints (amphiarthrosis) and synovial joints (diarthrosis). The function of the fibrous and cartilaginous joints is more for the stability of the musculoskeletal system. The synovial joints are designed for mobility. Fibrous joints allow for little to no movement. These joints are strands of collagen fibers which is why they provide very little movement. Fibrous joints are located in an area of the body that there should be no movement. An example of a fibrous joint is the sutures of the skull. Cartilaginous joints allow for very little movement. These joints are fibrous capsules or disk. Cartilaginous joints do not allow for much movement but can relax under certain circumstances. An example of cartilaginous joints is the joint between the ribs and sternum. Synovial joints represent the majority of the joints in the body. The joints are freely movable and allow for ease of movement between bones. A thin layer of hyaline cartilage covers the bones on either side of the synovial joint. A synovial membrane lines the joint cavity and synovial fluid fill the synovial membrane. The sac containing the synovial fluid is called a bursa. This synovial fluid reduces the friction between the two bones at the formation of the joint. A fibrous capsule encloses the entire synovial joint. 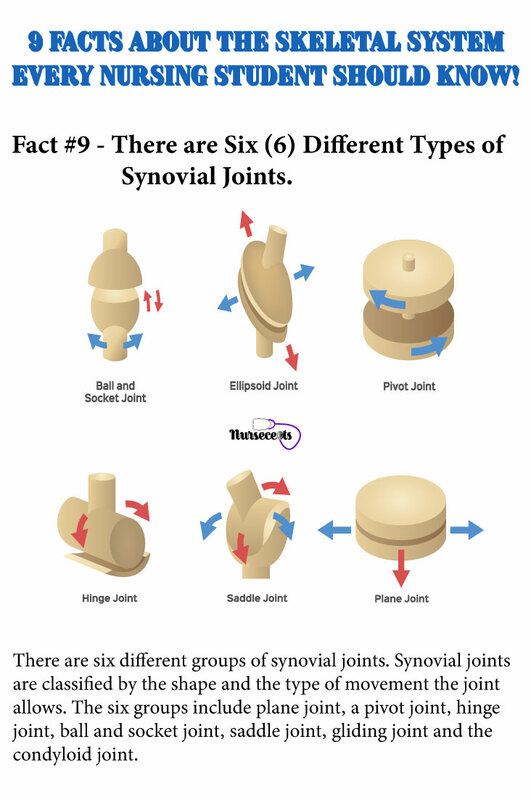 Fact #9 – There are Six (6) Different Types of Synovial Joints. As mentioned earlier, the synovial joints are designed for mobility. There are six different groups of synovial joints. 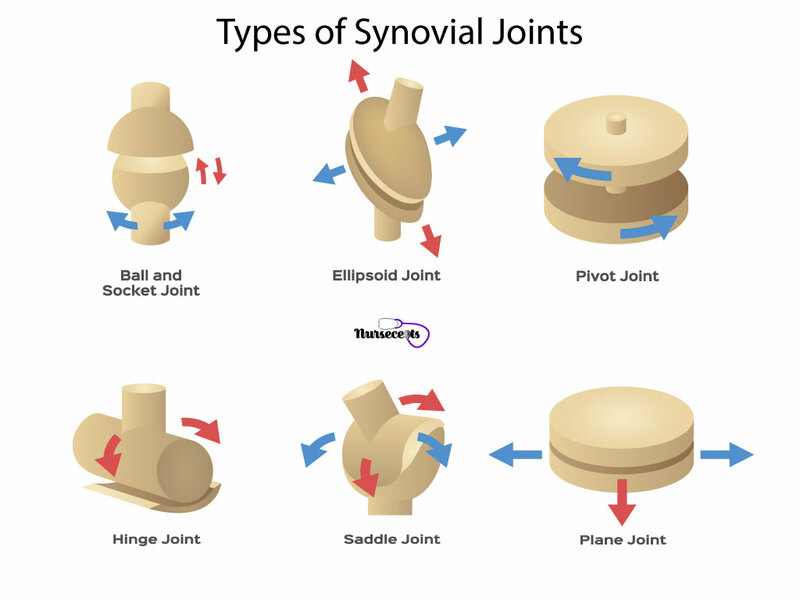 Synovial joints are classified by the shape and the type of movement the joint allows. The six groups include plane joint, a pivot joint, hinge joint, ball and socket joint, saddle joint, gliding joint and the condyloid joint. The pivot joint has one bone with a rounded end that rotates on the circular ring of another bone. So, the only movement of a pivot joint is a rotation movement. An example of this joint is in the neck which allows the head to turn side to side. For more information about body movements such as rotation and the ones mentioned below, read 7 Things About the Muscular System Every Nursing Student Should Know. A hinge joint has one bone with the shape of a cylinder that fits into the concave surface of another bone. The hinge joint can bend in only one direction and return to a straightened position. An example of a hinge joint would be the elbow or the knee. These joints can only perform flexion or extension. Ball and Socket joints consist of a rounded end of one bone fitting into the cup-like portion of another bone. The ball and socket joint allows for the greatest movement in all directions. This joint can perform flexion, extension, rotation, abduction, and adduction. Examples of the ball and socket joints include the shoulders and the hips. A saddle joint has one bone that is a convex shape and another bone that is a concave shape. The saddle shape supports the contours of the bone that is resting on it. The saddle joint allows for movement from side to side such as abduction and adduction. Also, this joint allows movement up and down such as flexion and extension. An example of this joint is the base of the thumb. The bones of a gliding joint (or plane joint) each have a flat surface. The bones slide over each other. Gliding joints normally only allow for the movement of one surface over another surface. Examples of gliding joints include the bones of the wrist and ankles. The condyloid joint (or an ellipsoid joint) has one bone with an oval shape that fits into the cavity of another bone. The condyloid joints can perform flexion, extension, abduction, adduction, and circumduction. An example of a condyloid joint includes the knuckles. The skeletal system is a framework of bones, cartilage, and joints. This system protects the organs and allows for movement of the body. This article 9 Facts About the Skeletal System Every Nursing Student Should Know will give you a better understanding of the composition of bone and how bone can maintain and repair itself. The skeletal system works in coordination with the muscular system. These systems are necessary for a person to perform the function of daily living. Previous Post7 Facts About the Muscular System Every Nursing Student Should Know.